When you make your appointment with one of our personal jewelry consultants, you have begun a process that will deliver a piece of the finest quality and is crafted with the utmost care. 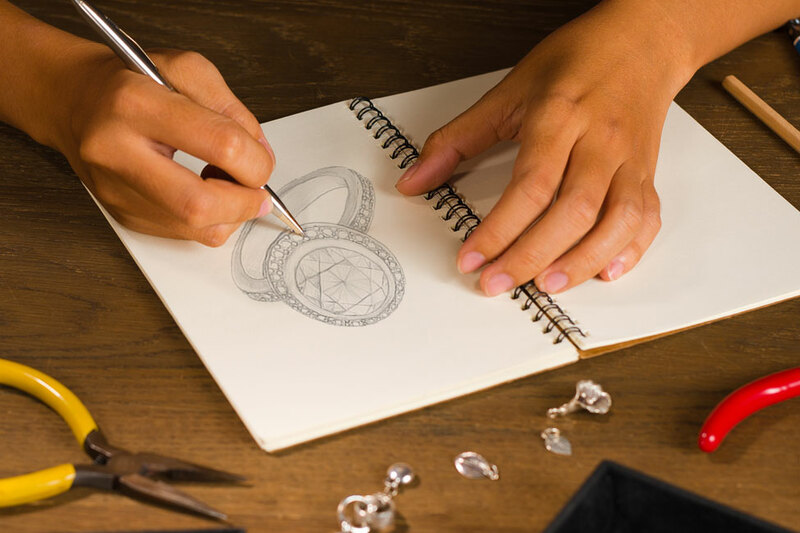 A custom-designed piece means your jewelry is precious and one-of-a-kind, a keepsake family heirloom that is never compromised. Here are the steps in creating a treasure you’ll always cherish. Call us to set up a private appointment. 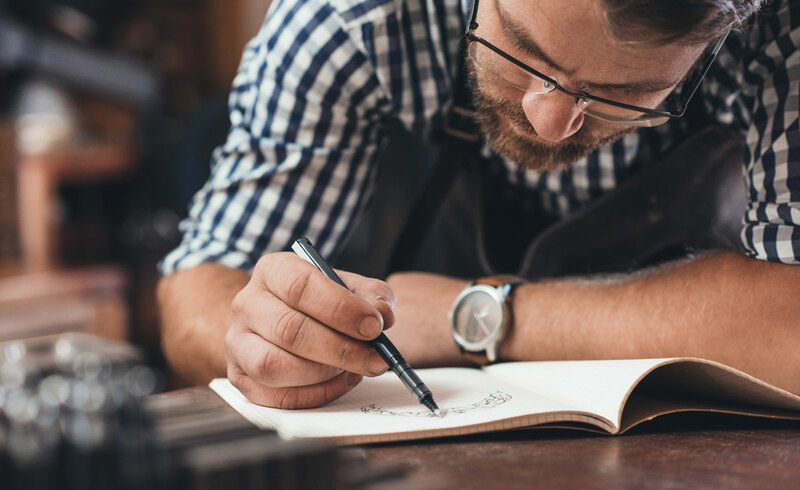 Whether you are interested in an engagement ring, wedding band, pendant, bracelet, necklace or a different piece or set, we’ll sit down and help you create exactly what your heart desires. If diamonds are incorporated, we’ll discuss the shape, carat weight, and other criteria. 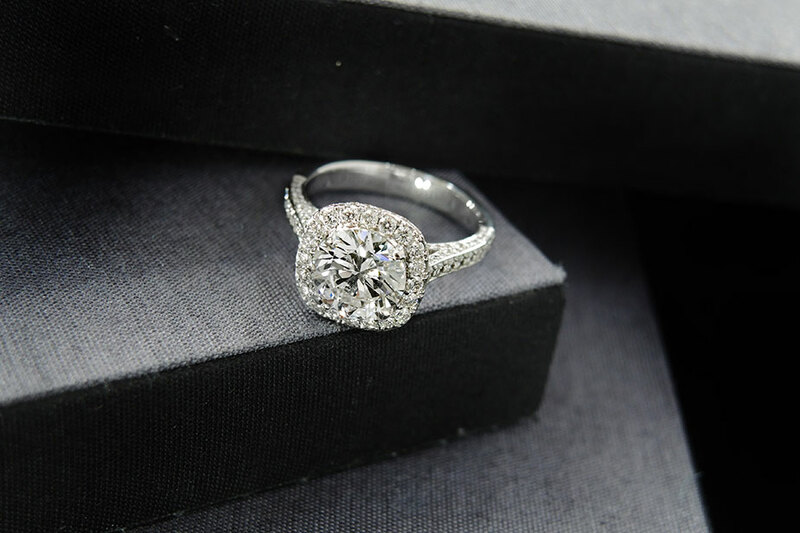 Once the diamond(s) is selected, we’ll help you decide on a setting. You may want to bring in images, pictures, or a drawing to show what you have in mind. We can also work with you to develop something from scratch. 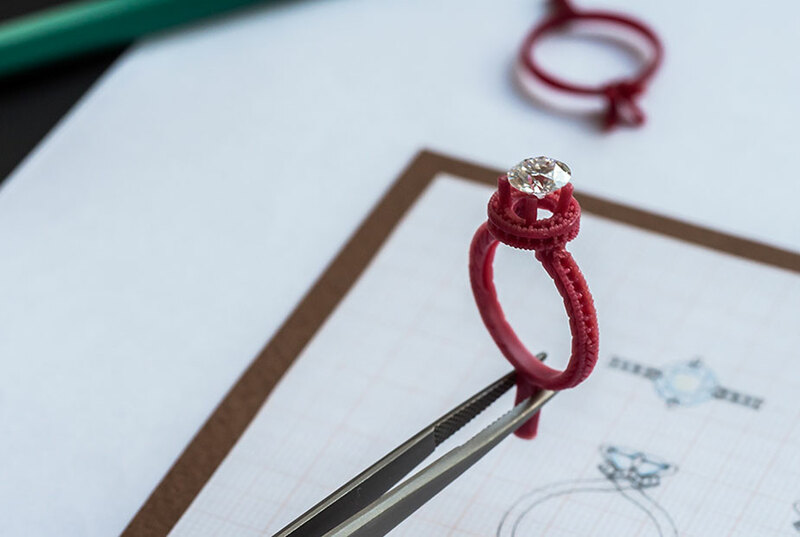 Whether you are interested in an engagement ring, wedding band, pendant, bracelet, necklace or a different piece or set, we’ll sit down and help you create exactly what your heart desires. Often times, This begins with images, pictures, a drawing or combination of all items to show us what you have in mind. However, the process may also start with a sketch if we are developing a design with you from scratch. 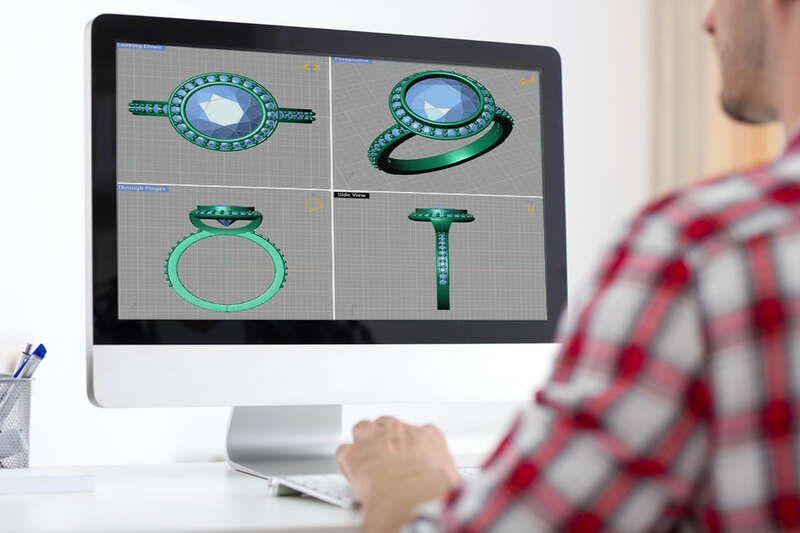 The CAD file is then used to generate a digital rendering of the ring to provide an illustration of what the finished product will look like. Each view of the CAD file can be rendered and the sample below is built using the perspective angle. At this point, you can determine whether you would like to move forward with the design or request changes. We only proceed to the next step after you approve both the CAD file and renderings. Wax growing means we “grow” a 3-dimensional wax of your piece. We use only the latest rapid prototype technology (EnvisionTec or Solidscape). If desired, you can now “see” your creation with the actual dimensions prior to casting. Once the piece has been conceptualized and discussed, we create a customized computer-aided design (CAD). The CAD file provides you with a feel of what your piece will look like. During this process you can request changes to ensure your jewelry is exactly what you have in mind, with all the design aspects you desire. Our designers can incorporate just about any changes to the CAD you can imagine. Our production department takes the approved wax and attaches (sprews) it to a tree using a hot wax pen. The wax tree is then covered with a flask and filled with investment. This is similar to plaster. The investment dries and the flask is inserted into an oven to burn out the wax (called Lost Wax Casting). When the wax is burned out, every detail of the piece is left as an imprint in the investment (which now looks like gypsum/drywall). The desired metal is melted and forced into the investment mold. When it cools it forms the unfinished piece. The piece is then broken out of the investment, clipped from the tree, and sent to the mass finishing department for polishing and diamond/stone setting. The piece is now complete.